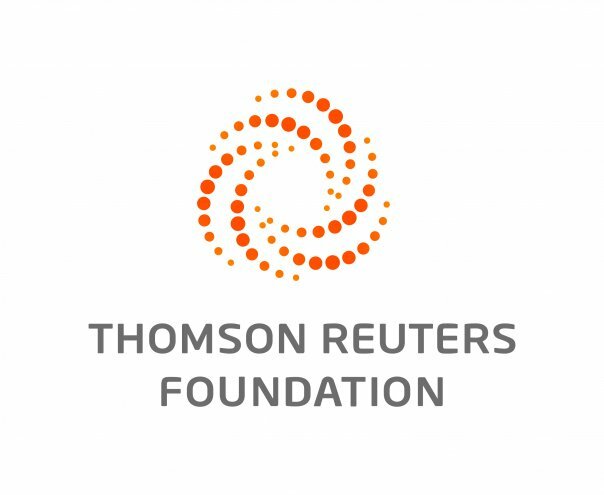 NAKURU, Kenya, May 2 (Thomson Reuters Foundation) - The sight of overflowing heaps of plastic waste at Gioto, the largest dump in Nakuru County, in Kenya's Great Rift Valley, was an eyesore that turned photojournalist James Wakibia into an environmental activist. Knowing plastic was a national problem, he decided to look beyond his hometown of Nakuru, seeking a way to capture the attention of government and consumers in urban and rural communities across the country. In 2015, Wakibia started a social media campaign, using the Twitter hashtag #banplasticsKE, to call for a ban on plastic use, focused on bags. A few months later, after Kenya's Cabinet Secretary for Environment and Natural Resources Judi Wakhungu tweeted back her support, he changed the hashtag to #IsupportbanplasticsKE. Wakibia would go out onto the streets of Nakuru, and take photos of people posing with a placard emblazoned with the hashtag, posting the images on Facebook and Twitter. His efforts have not been in vain. This February, a gazette notice by Wakhungu announced an end to the use, manufacture and importation of plastic bags for household and commercial packaging in Kenya from August 28. "I am excited my efforts have yielded this - something I have been yearning for," said Wakibia. "Plastic bags are such a menace." This is the fourth attempt by the Kenyan government to do away with plastic bags. In 2005 and 2007, it prohibited plastic bags with a thickness of 30 microns, and in 2011, it also banned 60-micron plastic bags, to include all those considered light enough to be blown away by the wind. But the measures have been a failure so far. Across Kenya, shoppers remain addicted to plastic bags, which are dished out at supermarkets with provisions such as fruit and vegetables, cosmetics and toiletries - already wrapped in other plastic bags. Bags can also be bought separately from retail stores or open-air stalls for 5 ($0.05), 10 or 20 Kenyan shillings, depending on their size, for individual use. This time there will be no exceptions, said Geoffrey Wahungu, director general of the National Environment Management Authority (NEMA), a state agency that advises on environmental matters and enforces related laws and policies. The previous bans struggled because they imposed restrictions based on a bag's specific thickness, he said. Now only primary packaging will be allowed, meaning packaging at source where the plastic is in contact with the product and is considered important for health reasons, he explained. Anyone in the supply chain who contravenes the gazette notice will be subject to a one to two-year jail term, or a fine of 2 to 4 million shillings as provided for in the 2015 environmental management law, Wahungu said. Manufacturers, suppliers and importers have until the end of August to clear their stocks and adopt biodegradable alternatives, he noted. Controlling manufacturing by unlicensed operators inside the country could be tough, Wahungu acknowledged, but as their supply of raw materials is cut off by the import ban, they will likely find it hard to continue. 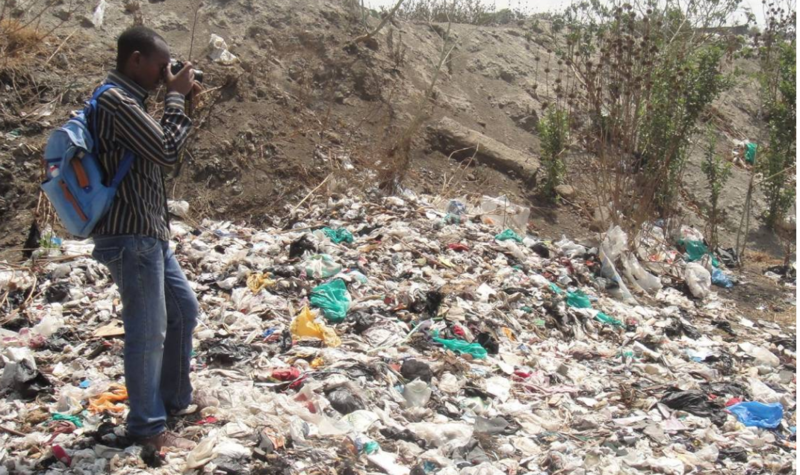 James Waikibia, a photojournalist turned environmental activist, at the Gioto dumpsite in Nakuru County, Kenya, March 27, 2017. Meanwhile, NEMA is encouraging innovative packaging schemes utilizing sisal, water hyacinth and papyrus reeds. Efforts have kicked off to raise public awareness ahead of the ban through the media, county governments, religious leaders, and community leaders and residents' associations. The government is also introducing economic incentives to counter potential job losses, a threat manufacturers have warned about, including support for recycling initiatives. Wahungu said the agency is sensitizing the judiciary to ensure smooth implementation of the ban. And it is aiming to curtail plastic imports through closer collaboration with the Kenya Revenue Authority, the Kenya Ports Authority and the Kenya Bureau of Standards. Separately, the East African Community bloc is working towards controlling the use of plastics across the region, with a related bill expected to come up for discussion at the Arusha-based East African Legislative Assembly in May. Plastic accounts for around 8 percent of total waste released into Kenya's environment, but causes some 90 percent of pollution, choking land and marine ecosystems, said Wahungu. Gilbert Obwoyere, dean of the Faculty of Environment and Resources Development at Egerton University in Njoro, said plastic waste can be found everywhere. "Plastics hang from trees in town - there are plastics in the air when there is wind. Oceans, lakes, rivers and wells are all clogged with plastics. And they are not adding any value into the ecosystem," he said. For him, the ban will serve as a catalyst to invent new packaging - which Kenyans will soon have no option but to adopt. "Once people know there are no plastics, they will come up with something that is environmentally friendly, and might even be cheaper," he said. But not all Kenyans are ready to make the transition. Sammy Mwangi, a commercial motorcycle operator in Section 58 neighborhood on the outskirts of Nakuru, is jittery about how the ban will affect employees in plastic manufacturing. "They will lose their jobs and where does the government expect them to go?" he said. Mokaya Nyarenchi, who hawks peeled pineapple in plastic bags in Nakuru's central business district, is also worried. "Introducing paper-style wraps will disadvantage traders like me who sell fruit in small portions," he said. But for Albert Mose, a computer technician in the South Rift town of Eldoret, it's high time for Kenya to put a stop to plastic pollution. "It's just about people changing their attitude to embrace a clean environment," he said.